Two leading ethnic Shan youth groups on Tuesday released statements calling for an immediate end to fighting between Burmese government forces and ethnic armed groups in northern Shan State. According to Sai Harn, the head of the Tai Youth Organization (TYO) in northern Shan State, the conflict has created many problems, including human suffering, economic damage, and an adverse effect on the ongoing peace process. “We oppose any group that creates problems for our people,” he said. “As peace talks in the country are continuing, we want these matters brought to the discussion table. Our people have been living in a war zone for too long. We do not want this kind of thing to happen again. “Because of the fighting, our people are afraid to [go outside to] grow crops. Or even if they do have crops, it is difficult to sell them. Many roads and bridges have been bombed so people cannot travel and sell their crops. Sai Aung Myint Oo, a representative of Shan Youth Yangon (SYY), said that the conflict affects not only civilians but also armed organizations. Meanwhile, Chinese Ambassador to Burma H.E. Hong Liang urged all parties involved in the fighting to immediately cease military operations, and start negotiating peacefully. Clashes broke out in the villages of 105-Mile, Mong Koe and Parng Zai in Muse Township, as well as in Namkham and Kutkai on November 20 between the Burmese army and an ethnic alliance of Arakan Army (AA), Kachin Independence Army (KIA), Myanmar National Democratic Alliance Army (MNDAA) and Ta’ang National Liberation Army (TNLA). The fighting has compelled thousands of civilians to flee their homes. Many have crossed the border into China. According to China Radio International, more than 3,000 people are staying in makeshift shelters in the town of Wanding, while others are staying with relatives on either side of the border. Aung San Suu Kyi’s State Counsellor’s Office updated its report on Tuesday, clarifying that at least ten people have been killed in the fighting and more than 30 injured. 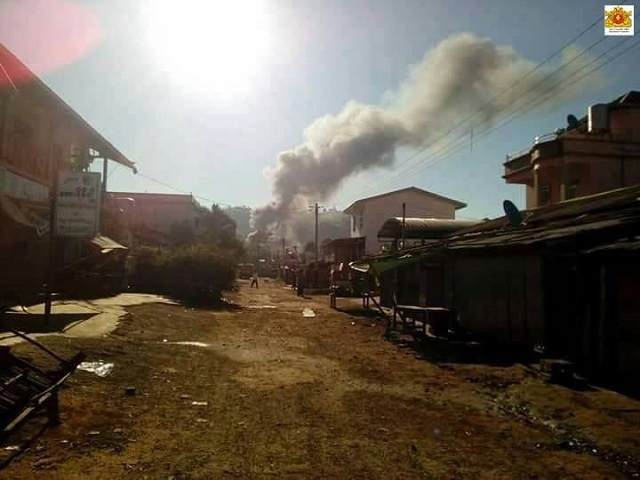 Yesterday, Shan Herald reported that due to renewed clashes, thousands of residents from Muse – one of Burma’s largest border trading points – had closed their shops and fled the town, leaving it eerily quiet.